If you've got a little safari lover on your hands then this wonderful new play set from Orange Tree toys is going to have everyone talking. 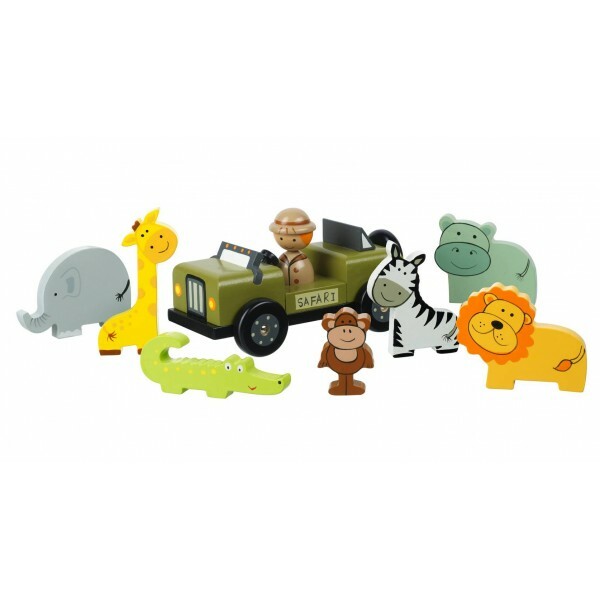 With enough pieces to hold your own mini Safari, including a wooden Safari truck, a safari ranger and a set of wooden safari animals, including; a lion, a hippo, a giraffe, an elephant, and a crocodile, little hands are going to be able to do lots of role play. Colourful, engaging and with loads of play value, it's a set that's undoubtedly one of the best toys to hit the market in recent years, in our opinion. Its a great set, full of play options, that's going to delight anyone that receives it. It's made to the highest standards of quality and style - the pieces are all made in hand painted wood. It comes beautifully packaged in a clear fronted presentation box, so it makes a really high impact gift.